Such a cute idea for a brand-new eatery. I hold fond memories of the State Buildings, where, as a sixteen year old outside clerk, I traipsed up and down stairs or into rickety lifts to deliver documents or have titles searched or stamped. Back then, I was not yet a wheelchair user. As a disability activist, it thrilled me that the old buildings held a history of social activism, of places where people came together for a cause. That’s why it shocked me when I spotted this post in a friend’s newsfeed on social media. And then the picture, of a steep shard of metal with an almost 30 degree aspect, the type of adventurous activity that most wheelchair users would write off as being dangerous, impractical and downright discriminatory. 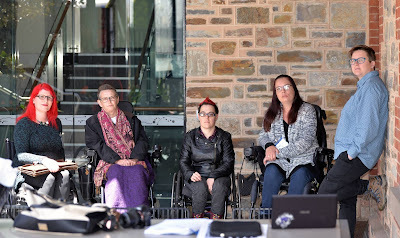 Disabled Perth lawyer Prue Hawkins also visited Petition – just yesterday, in fact. She asked where the accessible bathroom was, and was directed to a flight of stairs. ‘I looked at the stairs and the girl who was directing me said brightly, oh, it’s okay, we have a ramp,’ she said. Prue, who has previously worked as a disability discrimination lawyer, says that she would have minded less if the building had not been very recently refurbished at a cost of over 100 million. ‘If it was some old building where they just couldn’t make the access work, then you tend to be a bit more forgiving,’ she said. In Australia, the Australian Standards Council has regulations for slopes of permanent ramps into buildings. The standard gradient is one in fourteen. We also have standards that say that you can’t NOT provide access. The relevant rule is known as ‘AS 1428.1’ and it requires new buildings to have a ramp - a ramp with a maximum incline of 1 in 14, a minimum width of 1000mm, level landings every 9 metres, safety kerb rails of at least 65mm height and handrails at heights between 865 and 1000mm. It applies to all new buildings that are used for commercial purposes, and it certainly applies to the building at Petition. The only defence in court against a discrimination claim is that the builder, business or company couldn’t afford the access arrangement. And with a 108 million price tag, it’s pretty unlikely that this was the case – good luck to the luxury hotel chain in proving ‘unjustifiable hardship’. 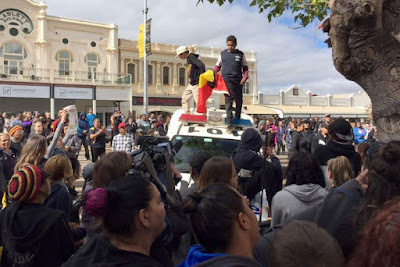 The City of Perth, who approved the reburbishment that was carried out by luxury hotel chain the COMO group, disbanded their Access Advisory Committee two years ago. A disability advocate says that it just ‘fell apart’ after a change of staff and through ‘lack of interest’, despite opposition from the disability community. 'The refurbishment should never have been approved,' he said. 108 million dollars, and disabled people are still regarded as second class citizens, as an afterthought. I wonder if those Barrack Street petitioners of 100 years ago included disabled people who lobbied for better access, for the right to be able to use the toilet or eat in public like other Western Australians. Or maybe they couldn’t get up the steps. Footnote: A group of disability advocates 'added their signature' to the above photo, with a message of complaint on Petition’s social media wall. The post was promptly removed. Disabled patrons are now lodging disability discrimination complaints against the developers. 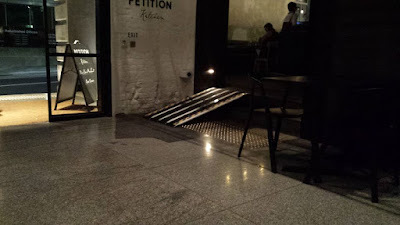 Image description: A steep portable ramp, made of steel, leans up across some stairs at an eatery. The sign on the wall reads, 'Petition'. Was the whole/ entire building refurbished or just the food tenancies mentioned? So much for the much-vaunted capital city status of the City of Perth under the new City of Perth Act. Obviously not Capital City for people with disabilities. As a person who is w/chair bound & born with osteogenesis Imperfecta(Brittle bones) NO WAY IN SHEER HELL WOULD I USE THAT RAMP. IM DISGUSTED BEYOND BELIEF. Absolutely disgraceful in this day and age! The developers should be forced to fix it, or people with disabilities should take them to the Human Rights Commission. Dined at State Building's Long Chim today... two weeks after the first trip & that rickety ramp. I wonder where my complaint is at. Very informative post, Thank you for sharing this site.